In this article we will design a LCD control panel based on a Hitachi HD44780 LCD display and the AT90S4433 AVR 8-Bit RISC Microcontroller from Atmel. Both components very common and not expensive. The control panel includes a watchdog to supervise the computer and has two buttons to allow for a dialog with the user. You can set IP address, netmask, gateway address, shutdown the computer, readout statistics, basically anything you want because most of the logic is implemented with a perl script and it can be changed easily. The panel is connected to your computer via RS232 serial line. For this article you need at least a partial installation of the Linux AVR development environment. How to set it up is described in this article: Programming the AVR Microcontroller with GCC. shop.tuxgraphics.org sells excellent LCD displays at a really good price. Our new design goes much further than that. It adds buttons for user interaction and includes a hardware watchdog to supervise the server. In addition to that the hardware provides for one analog input line. We don't use it here but you could connect a temperature sensor to it, for example. To design this you will need some electronic hobby skills. The parts we use are inexpensive and cost all together less than 40 Euro. The idea behind this panel is that it should allow you to control a server without monitor or keyboard. Linux is a very reliable server operating system and can easily be controlled remotely. However when you connect it to a network the first time you need to set the IP address, gateway and netmask. This panel allows you to set these addresses. It also gives you the ability to shutdown the server while you are still in the server room. The design of this panel is very generic. All the "server specific" parts are implemented in a perl script. The entire hardware, the state of the buttons, text on the display, LEDs..., can be controlled via ASCII commands. You can therefore use the design to build an mp3 player or control your toaster, what ever you want. 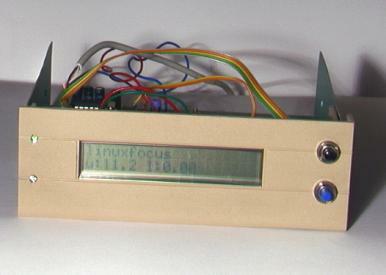 1 x 2 line 20 character LCD display with HD44780 compatible interface. All LCD displays that I have ever seen with 14 or 16 pins on the connector were HD44780 compatible. You can also use a 3 or 4 line display but then you will need to modify the software a bit. In addition to that you need some wires and connectors for power and RS232. If you have a 2 line display then you can mount it onto a thin aluminum metal sheet and fit it into a 5.25" bay on your server. I used eagle for Linux to design the schematic and board. It's an excellent software but you will need some time to learn how to use it. You can get a free version for private use at cadsoftusa.com. I will quickly explain the above circuit diagram. The AT90S4433 has 3 ports: PB, PC and PD. PC can be used as analog or digital input port. All ports can be used as digital input and output lines. This is controlled from the software via the DDR (Data direction register). We use all pins except 23 for digital lines (0 or 5 V). The Max232 is a voltage level converter. The RS232 interface uses +-10V and the Max232 converts this to 0-5V. On pin 1 (reset pin) of the AT90S4433 you find something called Brownout circuit. This circuit keeps the reset low (active) during times of insufficient power supply to prevent the CPU from executing wrong instructions or general malfunction. This can happen for a few milliseconds during power-up or power-down. It ensures basically that the program on the Microcontroller is started correctly. Some of you might wonder why there is a diode in parallel to the coil of the relay and the polarity such that looks like it will never have anything to do. This diode is very important! When you switch of the relay then a very high voltage is generated by the coil. It can destroy the Microcontroller. This voltage has opposite polarity to the supply voltage on the coil. The diode can be any cheap small diode nothing special but it is important to have the diode. The two push buttons need to be connected to the connector marked in the schematic as "DIGITAL IN PUSH BUTTON". They connect PD3 or PD6 to ground when pressed. 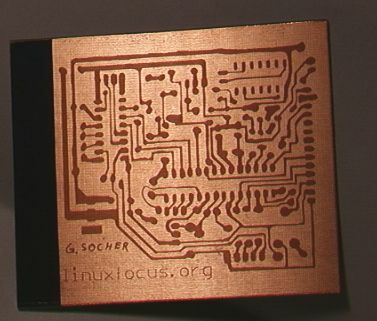 To etch the printed circuit board you first need to print this postscript file (linuxlcdpanel.ps.gz) onto transparent foil. In shops for architects you can get some semi-transparent plastic foil called Sinolit. Its produced by Regulus and is normally used for offset printing. Another good alternative is 60g paper + transparent spray (pausklar 21 from Kontakt Chemie). The advantage of paper and Sinolit is that the toner from Laser printers really sticks to the paper/foil and provides for good contrast. I have converted the postscript file to PDF in case you don't have a postscript printing system. The quality is however rather poor. 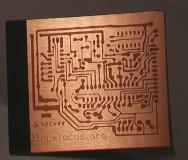 The exposure time for copper clad photo boards depends on the light source. For a normal home solaria it is between 1-2 Minutes. You can also use daylight but try to avoid direct sun light (it's too strong). You should experiment a bit with small stripes of photo boards to get the best exposure time before you use the real board. The exposed board needs then to be developed for several minutes in NaOH (Natriumhydroxid). After that you should carefully check the result and make corrections with a Edding 780 black paint marker (not the permanent markers for overheads, it is a marker with real think paint). I usually make the pads a bit bigger because I find that the pads from Eagle are too small for hobby use. Note: Somehow it seems impossible for the manufactures to agree on a common pinout and naming conventions for relays. I used a small 5V relay manufactured by Matsushita. Your relay might have a different pinout therefore change the board as needed (with an etch resistant paint marker). 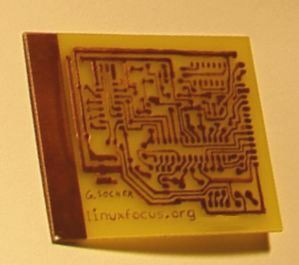 When you are satisfied you can etch the board in FeCl3 (Ferric Cloride). FeCl3 has good etching rates at room temperature. It it very easy to use and therefore good for use at home. You get the best results if the board is standing upright in a high container. Copper ions are heavier than iron ions and if you fill the FeCl3 into a small flat tub then the copper ions will accumulate at the bottom where the board is. When the board is ready wipe off the Edding paint marker ink with turpentine. You can leave the photo resist "ink" on. It will evaporate when you solder on it and protects the copper. lcd.c, lcd.h, lcd_hw.h: This is a generic avr LCD library. It is based on the work of Peter Fleury (http://jump.to/fleury). This version is a bit modified and more flexible. It allows you to connect the LCD hardware to any of the pins on the Microcontroller. You just need to change the definition in the file lcd_hw.h. avr-util.c, avr-util.h: functions to get various delay times. uart.c, uart.h: This is a library for the RS232 interface. It uses hardware interrupts. Every time a character is received from the computer the function SIGNAL(SIG_UART_RECV) will be executed and the data is copied from the receive buffer to a string buffer. The command language for our LCD panel is designed such that each command ends with with newline character. When a new line is found then then a flag (uart_rx_linecomplete) is set and the data is made available. This also means that you must not send commands to the display as fast as possible but wait a bit (a millisecond) after each line. Each command will be acknowledged by a result, ok, or err (for error). The driving perl program can therefore use the result as a trigger for to send the next command. analog.c, analog.h: Code for the analog to digital converter. It's again interrupt driven. A single analog to digital conversion is started and then the program waits for the SIG_ADC interrupt to read out the result from the ADC register. hardwarewd.c, hardwarewd.h: This is the watchdog. We use the internal divider (divide by 1024) to pulse the timer. The timer is a 16 bit register when we get an overflow we count down a 8 bit variable. With a 4MHz crystal we will count down our variable approximately every 16 seconds. The perl program signals that the computer that it is alive by periodically setting the variable back to a high value. If it fails to do so (because the computer hangs) that then the variable will decrease in its value all the time and when it reaches zero the relay will go click-clack and do a hardware reset of our server. linuxlcdpanel.c: This is the main program. It will continuously check for commands from the RS232 interface and button press events. Very easy. You find a description on how to program the Microcontroller in the first article: Programming the AVR Microcontroller with GCC. This is documented in the circuit diagram above as well. Now the serial line driver is initialized to use 9600 Baud and you can start to "talk" to your LCD panel. Open 2 xterm windows. In one you type "cat /dev/ttyS1" and in the other you type "cat > /dev/ttyS1". Now you can e.g type the command l=11 (switch on LED 1) or l=10 (switch off LED 1). You can see in the first xterm that our LCD panel acknowledges your commands with "ok". All available commands are explained in the README.commands file. The source code archive contains a perl script called ttytest.pl that does nothing but switch on and off the red led in intervals. It is meant to be used as a simple example program that shows how to drive the LCD panel. You can use it as a base for your own program. Take a look at the source code. It requires some knowledge of perl but it is a rather short program. The watch dog is off by default. You switch it on with the command w=1 and you set the timeout with s=x where x is a value between 1 and 255. E.g s=10 will let the watchdog timeout in 10*16sec=160sec. The driver program needs set the timeout periodically to avoid that the watchdog hits. If your server should ever lock up then the driver program will no longer set the timeout and the watchdog hits. I know that Linux servers almost never hang up. However if they hang up and get stuck then there is usually nobody at site to press the reset or nobody knows where the server is because there where no problem with it for the last 2 years. The watchdog is designed such that it will hit only once. This is to avoid it hitting again during the file system check which will probably follow after the reset. When the server comes up again the driver program needs to re-enable it. To physically connect the watchdog you need to find the two wires that go the reset button of your server. In parallel to this reset button you need to connect the relay from our watchdog. The watchdog guarantees that the system is always able to execute programs. It does not guarantee that a webserver or a database application is still running and responding. To check such things you should use a crontab entry or other programs. You can be confident that the crontab will be working because the watchdog ensures that software in general is still executing. For example you can design a script that is triggered by a cronjob and downloads a webpage from your webserver every 15 minutes, but you have to be careful with that: A webserver can get heavily loaded by a lot of requests and then it is normal that it does not answer all of them. Therefore you should count how often the webserver did not answer. If it did not answer at all in the last 10 checks then you can restart the webserver or trigger a normal reboot (not a hard reset via watchdog). This can again be used in combination with a crontab entry to regularly check the disk usage. Now make a backup of your original /etc/rc.d/init.d/network script and copy the etc/network script from source code archive to /etc/rc.d/init.d/network. This script and the directory names are only valid for Redhat and Mandrake. The script etc/network_all_distributions is more basic and will work with any Linux distribution but you need to figure out where your Linux distribution has its init-rc directories. It is slightly different from distribution to distribution. if you do not use COM2. and see your LCD panel in action. Note: It is save to play around and modify the IP address. The changes take only affect after the next reboot. Therefore test it and then change it back before you shutdown the server (you can also edit /etc/ifconfig_llp.txt to undo your changes). The log will contain entries when the system was manually shutdown, an IP address was changed (IP, GW, netmask) or when the hardware watchdog triggered a reset. Naturally you can not log the watchdog timeout when it happens (because the system hangs) but instead it will be logged at the next startup. Here are some "screen shoots" of the LCD panel in operation. This is not all of the functions offered by this panel. There are more and you can add your own. The main screen. Showing some name (linuxfocus in this case) and uptime and load. This updates periodically. To build this LCD panel requires some electronic hobby skills but it is not a very complex circuit. Our Linux LCD panel offers more functionally than any other control panel that I have ever seen and is very generic and cheap. The source code for this article linuxlcdpanel-0.7.tar.gz . The circuit diagram, the Eagle files and screen shoots are as well included.